Brain disease is attacking record numbers of people around the world. Microcephaly in infants is part of the same scourge. The global epidemic is being fueled by infectious waste that’s contaminating our food, water, air and more. 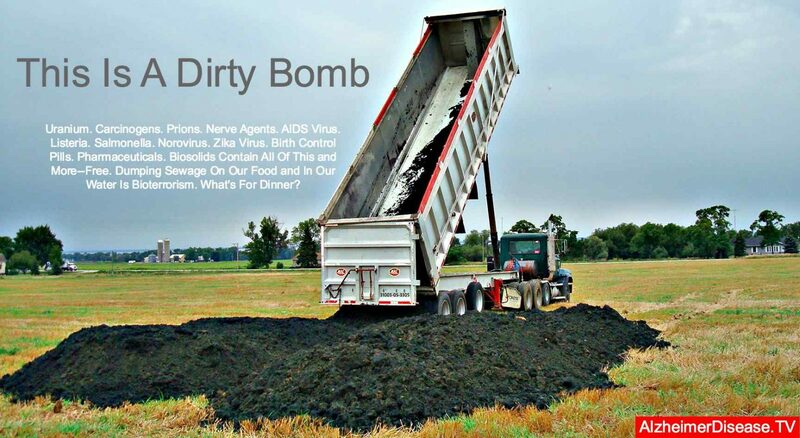 This infectious waste (biosolids) contains deadly and unstoppable neurotoxins, but it’s being spread like fertilizer in virtually every country around the world. In 1972, world leaders realized that dumping millions of tons of sewage sludge into the oceans killed entire underwater ecosystems. Some nations stopped the dumping immediately. Others did not. The U.S., for example, finally passed the Ocean Dumping Ban Act of 1988. It required dumping all municipal sewage sludge and industrial waste on land. That meant dumping it into landfills or dumping it openly on land, including farms, ranches, national forests, city parks, golf courses, playgrounds, sport fields and beyond. The Act went into effect in 1992 and it sparked a public health disaster. The practice is spreading tons of pathogens into the lives of people, livestock, wildlife and beyond every day. Landfills designed to handle these toxins are expensive. So, the dumpers hired a public relations firm to convince innocent citizens that neurotoxins and carcinogens are fertilizer. The PR firm started calling this toxic waste biosolids. It’s even sold in bags at your local home and garden store as soil for your garden and potting plants. It’s death dirt. Since then, millions of tons of infectious sewage sludge have been given to farmers as fertilizer and dumped into food and water supplies around the world every year. Those farmers and ranchers are being paid to dump deadly sewage sludge on their land and shut up. Sick livestock are sold or buried as quickly as possible. Those that make it to market are consumed by people and pets, while permanently contaminating everything that they touch. The landowners are held harmless if the sewage sludge causes damage to people or property downwind, downstream or on the dinner table. Landowners are literally making a killing with government assistance. Unfortunately, the practice of dumping extreme quantities of sewage sludge on land has created an even bigger public health problem. It’s killing people, wildlife, livestock and sea mammals downstream. Prions are infectious proteins responsible for a group of diseases known as transmissible spongiform encephalopathy (TSE). The operative word is transmissible. chronic wasting disease in deer, elk, moose and reindeer. badgers, mink, cats, elephants, dolphins and many other mammalian species have died from TSE. The concept of a species barrier is a myth. A deadly prion is a deadly prion. They don’t discriminate. According to Nobel Laureate Stanley Prusiner, Alzheimer’s disease, ALS and Huntington’s disease also are on the TSE spectrum. All are fatal, neurodegenerative brain diseases. Infectious prions are in the bodily fluids of its victims, including blood, urine, mucus, saliva and feces. As such, these victims send prions to the municipal sewage treatment plant where they remain untouched. A new study published in the journal Nature renews concern about the transmissibility of Alzheimer’s disease between people. A second study by the same scientist in early 2016 adds to the stack of evidence. Wastewater effluent and sewage sludge applied to land recycles prions into the environment. Once dumped on open land, prions remain infectious. Irrigation, precipitation and wind carry the prions into groundwater, streams, lakes, oceans and airways, including homes, offices and beyond. Reckless wastewater treatment policies and practices are now fueling a global epidemic of neurodegenerative disease among people, wildlife and livestock. 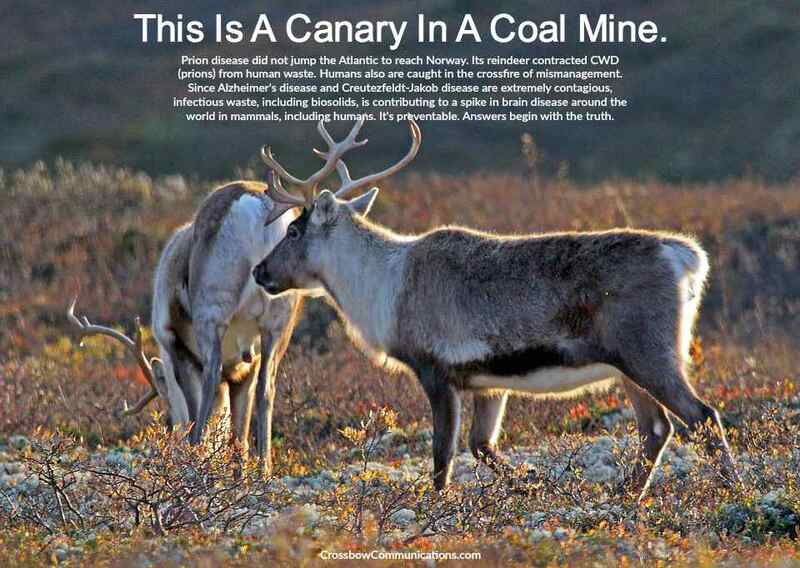 In fact, Europe just reported its first case of chronic wasting disease in a reindeer in Norway. There will be many more. The risk assessments for the land application of sewage sludge (LASS) are based on fraud and outdated information. The risk assessments were developed back in the 1970s and 1980s–before we knew about prions and other killers in modern sewage streams, including many forms of infectious medical waste. These outdated risk assessments make the entire practice illegal today under bioterrorism laws. Common sense makes them immoral and a crime against humanity. Because of these reckless practices, it’s time to reform many laws, practices and policies. For example, it’s vital to demand testing for mad cow disease in beef cattle and hope like hell that dairy producers aren’t spreading the disease in milk, cheese and meat. Wisconsin, dairy land U.S.A., has an epidemic among wild deer. It has dumped sewage sludge in virtually every county. There is no reason to believe that the cattle are immune from the prion epidemic that’s being fueled by sick soil in Wisconsin, Colorado and beyond. There is no reliable test for live animals, yet, which means that animal health is paramount for public health. There also is no testing of crops grown in sewage sludge, despite the science that has proven that crops for humans and livestock absorb the toxins and pathogens that they are grown in–including deadly prions. Ironically, the United States passed homeland defense laws to protect our food and water supplies from potential terrorists. Many other nations followed suit. When the U.S. government enacted the Bioterrorism Preparedness and Response Act of 2002, it classified prions as select agents that pose an extreme risk to food, water and much more. With reckless policy, the U.S. transferred responsibility for the management of select agents to the Centers for Disease Control (CDC–a private corporation that serves as the Coverup Division). These defenders of public health quietly took prions off the list of select agents because the regulation criminalized entire industries and several reckless practices. They obviously chose to defend the bottom line of corporations and the wastewater treatment industry instead of public health. 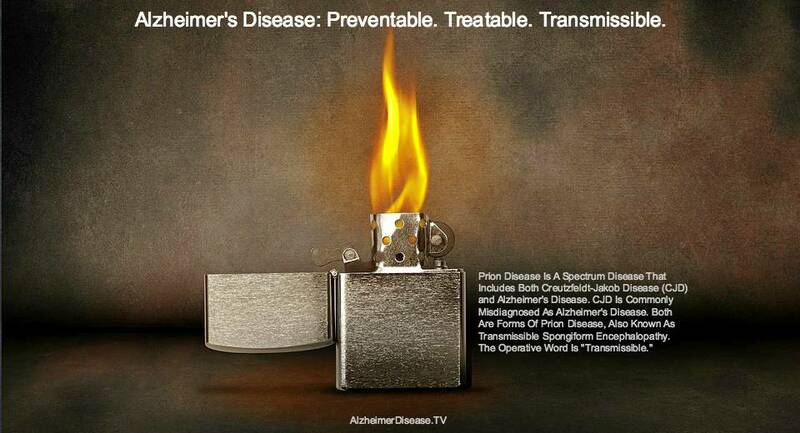 Unfortunately, prions linger in the environment, homes, hospitals, nursing homes, dental offices and beyond infinitely. They migrate, mutate, multiply and kill with unparalleled efficiency. Prions defy all attempts at sterilization and inactivation. Prions shed from humans are the most deadly. They demand more respect than radiation. They’re being ignored by regulators and industry alike. As such, food and water sources are being contaminated with the deadliest forms of prions. Municipal water systems can’t stop them from reaching water taps in millions of homes. Filtration doesn’t phase them. As stated earlier, the risk assessments for biosolids, sewage sludge and reclaimed wastewater were questionable when they were developed and they are total failures now. Plus, these risk assessments do not account for the possibility of sewage sludge dumped on land going airborne via windstorms and tornadoes. These events now leave a trail of sickness and death in their wake. Airborne sewage is a killer. It dumps the toxins, pathogens and superbugs everywhere. Unfortunately, the U.S. exported these bad practices to other nations who proceeded to contaminate their food and water supplies with sewage. If hospitals can’t stop prions, neither can the brain surgeons at wastewater treatment plants. The legislation banning ocean dumping was very explicit about the need to stop dumping potentially infectious medical waste into the oceans. Ironically, the current policy that promotes LASS ignores the risk of infectious medical waste and many other threats. It also ignores radionuclides, endocrine disruptors, birth control pills, antibiotics, flame-retardants and other toxins and superbugs. This toxic waste belongs in a lined landfill not our watersheds and food supplies. It’s time for immediate reforms. The same sewage-borne toxins and pathogens are still contaminating our oceans. Now, they’re dumped in further upstream. Entire watersheds are now being infected—including the oceans. The body count among people, livestock and wildlife has been stacking up ever since ocean dumping began phasing out. The nightmare is worse than ever. Biosolids and other forms of sewage mismanagement are now contributing to a global epidemic of neurological disease, including Alzheimer’s disease, Parkinson’s disease, autism, mad cow disease, chronic wasting disease, microcephaly and more. Industry and governments are scrambling to blame the global epidemic on anything but contaminated soil, water, food and air. They are playing dumb in the face of fraud and scientific suppression. Negligence is too kind of a word. Sewage sludge and reclaimed wastewater also contaminate our food with listeria, e-coli, salmonella and other killers. In fact, scientists are forced to come up with deceptive new names for the growing list of sewage-related ailments, including Zika virus, West Nile virus, epizootic hemorrhagic fever, equine herpes, valley fever and others. Industrial disease. Taxpayer dollars at work. As mentioned earlier, crops contaminated by sewage sludge can uptake prions and deliver them throughout the plant. Crops then deliver deadly prions to mammals that consume them. In fact, infected plants are spreading prion disease to several species, including humans. When hamsters consumed infected wheat grass, the animals were infected with prion disease. Researchers also found deadly prions in plants that just made surface contact with infected urine and feces. “These findings demonstrate that plants can efficiently bind infectious prions and act as carriers of infectivity, suggesting a possible role of environmental prion contamination in the horizontal transmission of the disease,” said Claudio Soto, the lead investigator from the University of Texas at Houston. Killer prions are impossible to stop. Prions are contributing to the death of millions of people now. Victims produce and spread prions daily because they’re in the bodily fluids of all victims. Millions of people with brain disease are contaminating their homes and communities, while exposing caregivers and family members to the contagion. The sewage from these victims is contaminating the local wastewater treatment plant and everything that enters or leaves these facilities, including reclaimed wastewater and sewage sludge. Once dumped on open land, these contagions remain infectious as they migrate, mutate and multiply forever. Prions demand containment and isolation, not distribution and consumption through air, food and water. These toxins demand lined landfills not reckless dumping on our dinner tables. Since prions migrate, mutate and multiply, dilution is not a solution. Prions are a public health nightmare, not to mention the carnage taking place among other mammals. The world has never done an effective job of managing its sewage. It’s an industry that drives by looking in the rear view mirror. It only swerves when the dead-end road is littered with body bags. After enough people get sick and die, new alternatives emerge. Today is no different. We now have nearly eight billion people competing for food, water, open spaces and places to dump their sewage. As prion disease spreads and as industrial-scale agriculture becomes more intensive, sewage is becoming deadlier by the day. The stakes have never been higher. The bodies are stacking up. The contamination grows stronger and spreads further every day. It’s time to stop dumping sewage sludge on land because of the prion risk and many others not accounted for in the antiquated and fraudulent risk assessments. It’s time for citizens to defend our land, water and air. Homelands around the world are under assault and ISIS has nothing to do with it. The terrorists are home-grown traitors. It’s treason. Today, the land application of sewage sludge is killing mammals and more around the world. Pathogens in sludge are causing brain disease, cancer and death. Let’s take a meaningful stand for food safety. Just say no to sewage sludge in our watersheds and food supplies. Safer alternatives exist.